What happens when industries collide? The Economist Intelligence Unit (EIU) is the research and analysis division of The Economist Group. Technology is bringing industries together, with healthcare, mobility and insurance next. How can your business prepare? 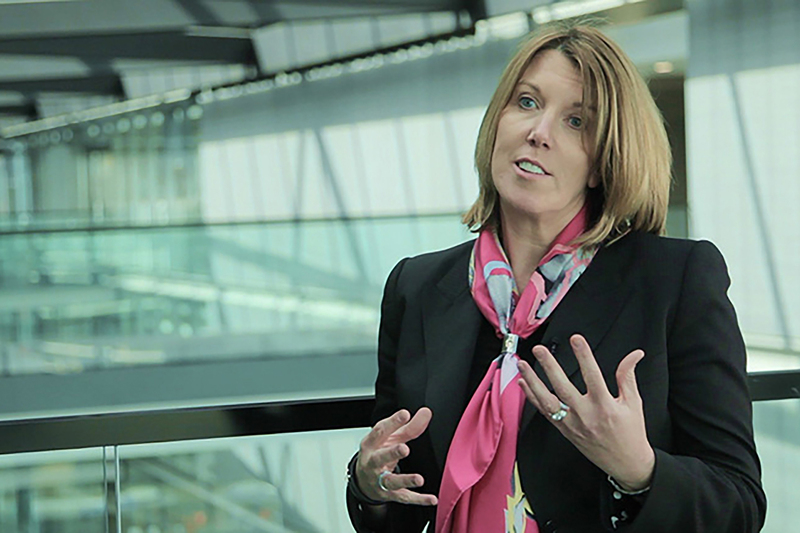 Alison Kay, EY Global Vice Chair for Industry, leads a team that helps companies navigate disruption and the convergence of industries. Kay uses her experience to guide companies through rapid technological shifts — addressing the commercial impact of emerging disruptive technologies and forecasting where the next tectonic shifts will be. Here, she explains the implications of sector convergence, how artificial intelligence will reinvent city life and why the latest technology just might re-imagine entire industries. Q: How has disruption blurred the lines between different industries? Industry disruption is largely the outcome of evolutions from key technology advancement and consumer behavior. Against a backdrop of digitalization and hyper-connectivity, disruption creates convergence nodes between previously separate industries. It can be difficult to assess the impact of certain disruptive technologies approaching maturity. For example, the 2,000% growth of the use of private and commercial robots from 2015 to 2030 could create a US$190b market. Smart health brings together very different stakeholders in new digital ecosystems: Governments, insurers, care providers, consumers and life-sciences companies have now become inextricably linked. The first sectors impacted were technology, telecoms and media companies. For years now, we have been subscribing to television content through telecommunications companies, making phone calls through cable TV providers and buying books and music through technology companies. Today convergence is redefining another wave of industries, including health care, consumer products and insurance. Q: What are the economic ripple effects of convergence? The unprecedented pace of industry disruption and convergence creates ripple effects across all industries. For example, by 2030 the world’s 750 largest cities are projected to account for 61% of global GDP. Smart cities will be technologically enabled, connected and resilient to environmental, social and economic challenges. Artificial intelligence will eventually orchestrate and optimize flow of traffic and allocation of energy throughout those megacities. Urban planning will need to account for new developments in health care, education and mobility — and make better use of public funds with more efficient models. Los Angeles has already saved US$8m by switching street lamps to LED with mobile sensors. Convergence also creates new markets and opportunities for companies or governments to grow and compete in a connected world. Industries traditionally ruled by a few corporations have seen new entrants from other sectors. Supplier and customer relationships will continue to be challenged by new digitally enabled business models. Q: How are companies navigating business convergence? Companies are increasingly creating portfolios of digital “bets” that help them explore beyond their own core industry. Typically, one company focuses on emerging innovations while the other manages the ongoing traditional businesses. There is also a significant shift in attitudes toward talent and leadership. In the past, companies sourced talent from their own industry. This has now fundamentally changed. We are seeing companies recruit top executives from industries that might converge with their own. Q: What kinds of challenges are businesses facing to deliver coherent strategies? It can be difficult for an organization to recognize external trends, pursue opportunities that aren’t directly related to its standard market and move quickly enough to benefit from new models. Companies increasingly adopt open innovation or corporate venture capital models to bring external perspectives. Investing in other entities allows large companies an opportunity to experiment with more agile processes, risky new propositions and cutting-edge technology. Integration is another challenge. Often companies underestimate the radically different types of skills and level of cultural change required, which is why strong leadership buy-in and a well-defined ecosystem is essential. Engaging in new ventures also creates challenges around investment and pricing of risk of these endeavors, and some private equity firms are changing their investment models to account for that.Executives should also pay attention to how disruption is impacting other industries. Don’t be so focused on the day-to-day of your core sector that you miss a tectonic shift somewhere else in the system. Don’t be so focused on the day-to-day of your core sector that you miss a tectonic shift somewhere else in the system. Q: How are companies positioning themselves to tap into these opportunities? Many organizations are forming partnerships, which sometimes also involve piloting initiatives internally. For example, global alliances can help companies stay close to customer requirements while leveraging partner companies’ knowledge and network from different sectors. Many market leaders now have teams that are in direct competition with each other within the organization. Others outsource the thinking to third parties, and we are also seeing the emergence of new C-suite positions to help drive the agenda. Q: Do you see convergence helping to solve global problems? I believe convergence can help solve big social issues such as climate change, urbanization and the rising costs of health care. To achieve this, we need alliances across traditional business boundaries. In this environment, we will also see public and private players leverage each other’s capabilities to address these large-scale problems together as an ecosystem. For example, chronic diseases are the most deadly and costly threat to human health. In the US, they’re responsible for 70% of deaths and 86% of health care expenses each year. Life-science companies, traditional health providers and technology companies can co-develop possible solutions that will drastically reduce the impact on public finances and improve health outcomes for people. Although difficult to manage, industry convergence could help solve issues such as climate change, urbanization and rising health care costs.